Have you ever pulled a card and thought to yourself, who the heck is this? 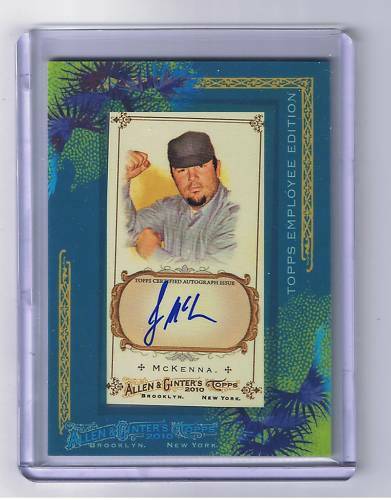 Few people might have had this problem with 2010 Topps Allen and Ginter this year. And I am not talking about the card of Wawra or whatever his name is. Topps released employee autographs in this set and are supposed to be extremely rare to pull. The only way to know you received one of these employee cards - besides having no idea who is on your card - is by the greenish border. The regular autos have a red border. Victoria Levan is one of the ten Topps employees who have a card in the set. She writes briefly on her blog about the card she is featured in and notes that there is a 1/1 with her soon-to-be-married name. Even though the idea of getting a Topps employee card isn’t appealing, some have sold well on eBay. One completed listing has gone for $99. To me, that would be the only reason to actually get one of these cards. But maybe there are aspiring illustrators or designers out there who want to collect these cards just like little kids who want to grow up and be baseball players. Right now, there are only two auctions on eBay with these cards. One guy has seven of the 10 employee cards and here is an auction of just one card. Baseballcardpedia has provided a checklist of the cards here. One wonders if people who are paying top dollar for these cards will come to regret it, or if the cards will retain value after the newness wears off.